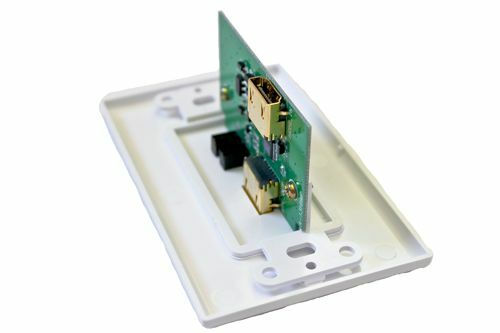 Our HDMI Single Repeater Wall plate will allow you to make long runs with your HDMI signals. A lot of our customers are finding that they need to run your HDMI cables long distances. This is what you need to make long distance runs possible. This makes it ideal to run HDMI cables to wall mounted TV's with no hassle involved. 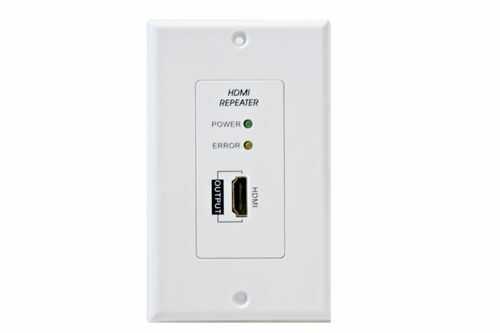 This HDMI Single outlet Repeater Wall Plate will deliver high bandwidth uncompressed video with ease. Provides the highest resolution possible with your compatible HDMI cables to give you the picture you desire. All you need is the Wall Plate and Cables and you are good to go. No need for any additional things. Our HDMI Repeater Wall Plate installs into a standard electrical box to give a clean and finished look to your home theater. Two LED's on the front of the output side indicate that the source device is connected and active. No external power is required since the repeater is powered by the HDMI source’s bus voltage. The low power consumption allows it to out-perform most other HDMI repeaters. Please Note: Maximum total cable run should not exceed 100 feet / 35 meters and be a single HDMI Cable. Do not try to connect multiple HDMI cables together. Video quality is directly related to the interconnect length and quality as well as the source components. It is important to know the equipment limitations before extending the cable length. Separate power LED and error LED is included on this wall plate. Video data with HDCP copy protection also transfer. Supports screen reconnaissance via DDC, EDID or VDIF signals. SPECIAL NOTE - YOU MUST USE HIGH QUALITY CABLES IN ORDER TO REACH THESE DISTANCES. YOU MUST USE A 24 TO 22 GAUGE ( AWG ) HDMI CABLES TO MAKE THESE LONG RUNS. THIS INCLUDES FROM YOUR DEVICE TO THE WALL PLATE. DO NOT USE LOWER PRICED COPPER CLAD STEEL ( CCS ) OR COPPER CLAD ALUMINUM ( CCA ) CABLES. USE ONLY TRUE SOLID CORE OR STRANDED CABLES TO ACHIEVE THESE LONG RUNS.